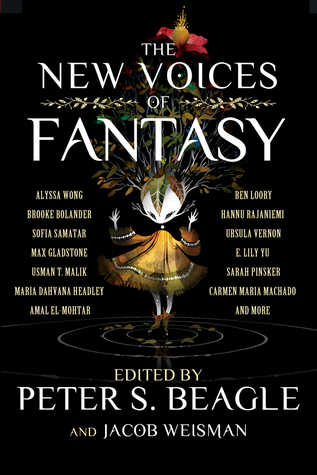 The New Voices of Fantasy is a collection of recent (2010 or later) fantasy short stories by emerging authors, as selected by Peter S. Beagle, author of The Last Unicorn. I picked the collection up because I already recognized some of the names on the front and adored their work. Turns out some of my favorite short stories were already included! For instance, “Hungry Daughters of Starving Mothers” by Alyssa Wong. I loved this short story when I read it last year. It’s dark, haunting, and utterly unforgettable. “A Kiss with Teeth” by Max Gladstone was one of the first stories I read when I started exploring short SFF fiction online. It’s a story about marriage and fatherhood, but centered around a vampire. In “Jackalope Wives” by Ursula Vernon, the memorable Grandma Harken is left to deal with the results of her grandson’s folly. These three stories were already among my favorite short fiction of recent years, and I was glad to see them included. I was also familiar with some of the other authors, but their stories were new to me. “The Practical Witch’s Guide to Acquiring Real Estate” by A.C. Wise is an utterly delightful piece about the relationship between a witch and their house. The story starts with a discussion of how the word “acquiring” can be problematic when it comes to real estate (as it implies that the house isn’t choosing the witch!) and gets even better from there. “Selkie Stories Are for Losers” by Sofia Samatar is a slice of life narrative about a girl who’s mother is a selkie and her developing friendship with a girl with a suicidal mother. It’s a lovely story, and I immediately went to include it in a recommendation list of queer paranormal short stories. In “Tornado’s Siren” by Brooke Bolander, a tornado falls in love with a woman and she has to decide if normal is what she really wants. It’s a unique concept, and Bolander pulls it off admirably well, creating a charming short story. JY Yang presents a tale of a woman who dreams of tigers with “Tiger Baby.” Whenever she closes her eyes at night, she’s running on four paws, a sleek orange and black shadow. But while she may believe herself to be a tiger, there’s another truth to what she is. JY Yang is a truly talented author, and I look forward to reading more stories by them. Amal El-Mohtar was another author who’s inclusion in this collection I was excited about. However, “Wing” didn’t prove to be a very memorable story. It’s a beautifully written story about book lovers, but I didn’t find it to have the staying power of some of the other stories. I’d read at least one other short story by E. Lily Yu, but after reading “The Cartographer Wasps and Anarchist Bees,” I know I need to read more by her. It was hands down one of the best stories in the collection. It’s just got so many layers! In this story, a nest of wasps conquers a hive of bees, and the epic tale of these insects comes to involve colonialism and differences in political systems. The rest of the authors were relatively new to me, although I may have read a few stories by some of them here and there. Some of the stories were intriguing and others weren’t to my tastes. Mind you, I wouldn’t say any are bad stories, and if I were rating each story individually, I don’t think any would get less than three stars. “The Tallest Doll in New York City” by Maria Dahvana Headley is one of the stories that left me cold. In this tale, two skyscrapers go courting on Valentine’s Day. In “The Haunting of Apollo A7LB,” a haunted spacesuit returns to the woman it’s owner loved… regardless of the fact that a living human is now wearing it. “The Pauper Prince and the Eucalyptus Jinn” by Usman T. Malik is a lengthy story (novella length?) that took up about a fifth of the collection. In it, a middle aged academic uncovers his grandfather’s past and the tale of a impoverished princess. In “Here Be Dragons” by Chris Tarry, two fathers who made a living pretending to be dragon hunters find themselves out of work and now stay at home dads. “The Philosophers” by Adam Ehrlich Sachs is a collection of three flash fiction stories about the relationships between fathers and sons, often told in an offbeat way. For instance, a son who partitions the different aspects of his relationship with his deceased father by literally wearing different hats. “The Duck” by Ben Loory is a short story about a duck who falls in love with a rock, told almost as if it was a fable. Other stories worked a bit better for me, although I still had mixed feelings about some of them. “The Husband Stitch” by Carmen Maria Machado is a powerfully feminist story about a woman who gives everything of herself over to her husband — except for the ribbon she wears around her neck. Yet, he isn’t content until he has all of her. This may have been my favorite story by a new to me author. One of the others I enjoyed was “Left the Century to Sit Unmoved” by Sarah Pinsker, the tale of a small town with a pond where people who dive into it sometimes disappear. Despite the risks, residents still take the chance of diving in. In “The One They Took Before” by Kelly Sandoval, a musician tries to figure out how to live after being returned from the world of the fae. “My Time Among the Bridge Blowers” by Eugene Fischer is perhaps the story I’m most conflicted by. A self styled anthropologist ventures to a remote village where the inhabitants can walk on air. I believe that the story’s meant to be a criticism of the sort of cultural imperialism that can go along with this, but I don’t know if it was entirely successful in that regard. Overall, The New Voices of Fantasy is a very strong collection and one that I wouldn’t hesitate to recommend. It is perfect for anyone who looking to discover some of the newest talent in the genre, as well as for anyone who just loves a good story.